It was just after sunrise and two of us had set off on our morning safari. 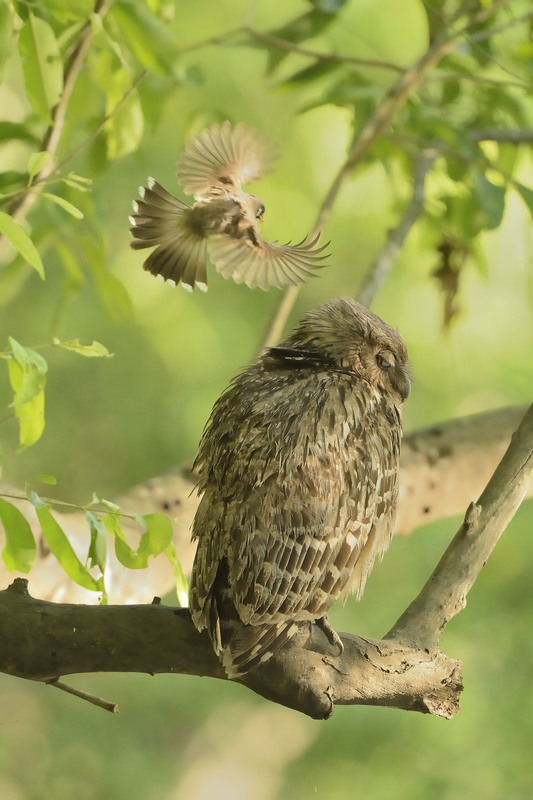 The first sight that greeted us was this Brown Fish Owl. We had seen this species the previous day in great light and the first thought was to take a few pics and continue. That is when we realised that there was an interesting story unfolding out here. There were a couple of Himalayan Bulbuls that were perched close-by and they were repeatedly taking off and flying into the owl in an apparent bid to startle the big bird into flying off. We reckoned that they had their nest nearby and wanted the predatory bird away from that area to protect their nest. So we decided to wait and try and capture this in a frame. Now, the problem with using a APS-C body (crop sensor) in such a setting are many – not much breathing space in the frame to capture the action and the lack of high-ISO performance to name a couple. I decided to circumvent the latter by bumping up the ISO all the way to the max of 6400 to get the required shutter-speed and take a chance on the graininess. The first one was tougher to negotiate – it needed a good positioning of the bean-bag and the camera, preset focussing & settings and then keeping the eye on the action directly (rather than through the viewfinder) and clicking when the Bulbuls took off from their perch towards the owl. Definitely 30 mins well spent – we came away with a handful of some interesting action pictures.